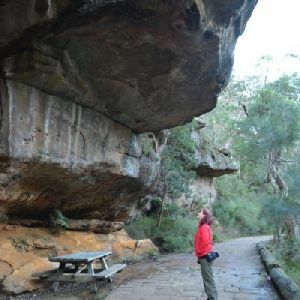 From the top of Otford Station, this walk follows the signs to ‘Royal National Park’ up some stairs. Once at the top of the stairs, the walk turns left and climbs up the steep concrete path for approximately 50m to the top, where it comes to the intersection marked as ‘Station Rd’. This walk turns left and follows the flat dirt road, passing an intersection with another road on the left. The walk continues along to the next intersection, where it turns right onto Fanshawe Rd. This walk follows Fanshawe Rd up the long hill until coming to an intersection with an asphalt road signposted as ‘Lady Wakehurst Drive’. At the intersection, this walk turns left and crosses the road, continuing for approximately 25m until coming to a car park and the entry into Royal National Park. There is a large green sign here saying ‘Otford Lookout’. 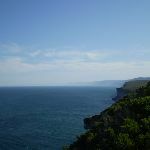 Veer right: From Otford Lookout, the walk heads up the stairs on the seaward side of the car park, winding up the hill and along the fenced of cliffs, keeping the ocean to the right as it steadily climbs up the hill. 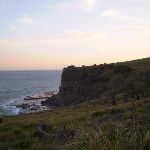 After a while, the track breaks away from the cliff and continues along the bush track, climbing up the hill until coming to an intersection marked with a signpost saying ‘Werrong Beach’. 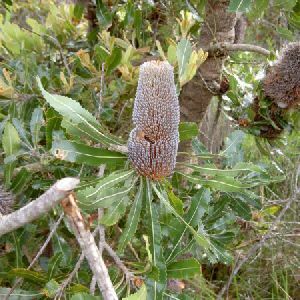 Continue straight: From the intersection, this walk follows the Coast Track along the bush track, winding up the long hill the the top, where it flattens out and continues along a well-managed bush track through a rather beautiful section of ferns. After quite a while, the track joins onto a flat service trail which it follows, undulating gently until it comes to the signposted intersection of the North Era bush track. 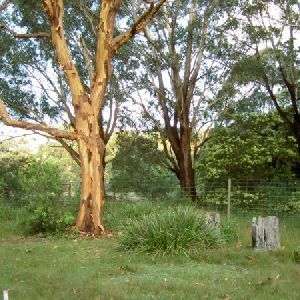 Turn right: From the intersection, the walk follows the ‘North Era’ arrow along the bush track, winding through the thick bushland and down a long hill for several hundred metres, gradually steepening before sharply turning left. After the change in direction, the track heads through the ‘Palm Jungle’ along the narrow bush track. At this point, the track is largely clear but in some places there are obstacles like fallen trees and branches. The track continues in this manner for some time before emerging into grasslands. Continue straight: From the end of the palm jungle and the start of the grasslands, the walk heads through the grasslands and along the coast for a while before winding down to the signposted intersection with the Burning Palms track, near the rangers’ hut. 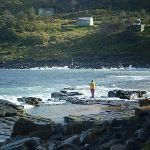 Turn right: (only to be attempted at low tide and low swell) From the beach, this walk follows the rocky passage beneath the rocky headland (keeping the headland to the right). 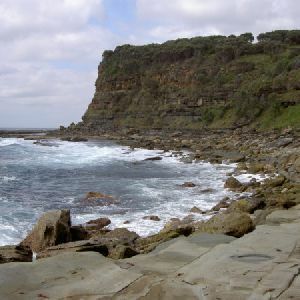 The walk rounds the first prominent headland to a creek that drops off the cliffs above. This walk heads out onto a second prominent headland to the Figure 8 Pools. 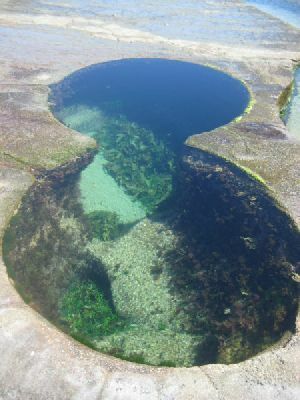 There are a number of Figure 8-shaped pools, but one main one. The pools are towards the sea, in line with the gully. At the end of this side trip, retrace your steps back to the main walk then Veer right. Veer left: From the intersection near the rangers’ hut, this walk follows the Burning Palms arrow along the bush track winding around the back of the beach (which is to the right), until it joins onto a metal walkway. This continues until the trail passes several small cabins and begins to head steeply up the long hill, until the track reaches an signposted intersection at the top of the hill. Turn right: From the intersection, this walk follows the ‘North Era’ arrow along the bush track heading down the hill, keeping the ocean to the right as it winds down to the intersection with the faint bush track in the large grassy clearing on the side of the hill, above some of the cabins at Era. Continue straight: From the intersection, the walk heads down the hill past the cabins to the bottom where it comes to South Era beach. From here, the walk continues around the back of the beach, keeping the ocean to the right as it continues up the other side to the top of the ridgeline where it comes to the intersection with a faint bush track (heading off to the left). Continue straight: From the top of the ridge, the walk crosses the headland and open grassy area, down towards the beach (keeping the ocean to the right), coming to a ‘North Era Bush Campground’ sign just before the beach. 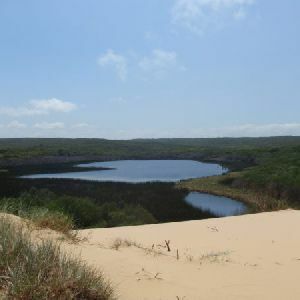 North Era camping ground, Royal National Park, is a large dune area situated directly behind North Era Beach. 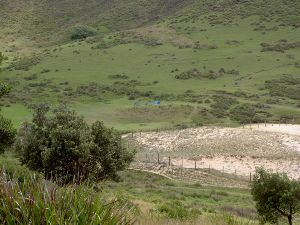 This camping spot is popular with surfers, and it also has a toilet and a cleared area to pitch your tent. A maximum of 36 people (12 sites) can camp here, so there is plenty of room for everyone. Open fires are not permitted, you can carry a fuel stove for cooking. A camping permit is required from NPWS before arriving (Phone:(02) 9542 068). 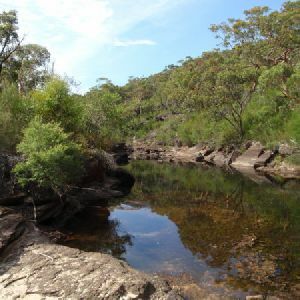 Water is often available from the creek (treat before drinking), If dry you can walk to Garie Beach for water, although the water here may also be dried up, during a dry period it is best to carry all your water with you. Continue straight: Keeping the ocean and the coast to the right, the walk heads north across the North Era Bush Campground to the base of the large grassy hill, which it climbs steeply to the top. 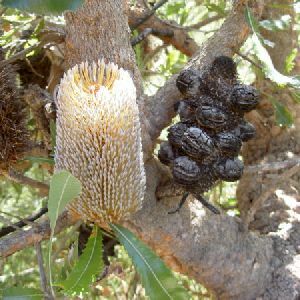 Upon reaching the top, the walk continues down the other side of the hill, winding down the bush track and wooden steps, until reaching the Little Garie Community Hall at the base of the hill. Continue straight: From the Little Garie Community Hall, the walk heads down the hill, keeping the sea to the right of the track as it leads into the gully. The walk passes several old cabins as it approaches the bottom, where the track passes a ‘Coast Walk’ sign, providing information on erosion issues in this area. From here, the walk heads between the ocean on the right and the base of the large grassy hill on the left as the track narrows. This continues until arriving in the Garie Beach car park. 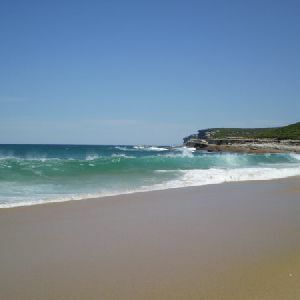 Garie Beach, Royal National Park, is a large, south-east facing, yellow sand beach. The beach is backed by steep headlands and gullies. There is a large car park at the end of Garie Rd for access to the beach. 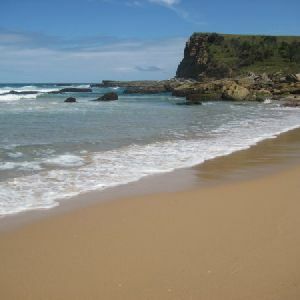 Garie Beach is popular for surfing, patrolled 9am-5pm from December to January. Facilities include toilets, kiosk, picnic tables, cold showers and Surf Life Saving Club. The water from the shower should be treated before drinking, this water comes from a tank and may be unavailable during dry periods. More info. 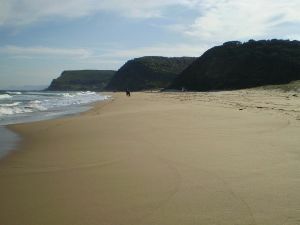 Turn right: From the car park, the walk heads approximately 200m along the beach, keeping the ocean to your right, to the intersection below the stairs (leading up the hill on the left). Turn left: From the intersection, this walk follows the stairs away from the ocean. The track winds up the hill steeply then continues for approximately 350m along the hillside, in and out of a gully, to rise up to the cabin signposted as ‘YHA Garie Beach’. At the end of this side trip, retrace your steps back to the main walk then Turn left . **On 02/12/2010 this hut was completely destroyed by fire and plans for the future are not yet decided . 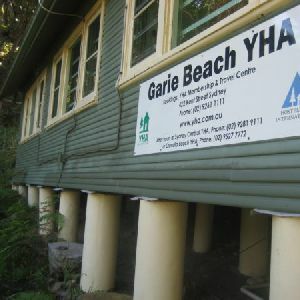 Accommodation no longer available Garie Beach YHA Youth Hostel, in Royal National Park, is a basic but comfortable cabin. 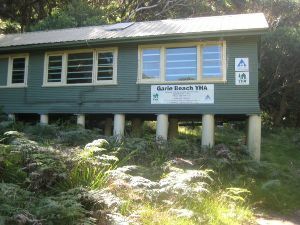 The unstaffed and locked cabin is situated north of Garie Beach car park, high on the hill behind the next gully. The cabin contains solar lighting, water, gas kitchen, a ‘loo with a view’ and the capacity to sleep twelve people. You need to provide your own bed sheets and toilet paper. The cabin costs $17.50/adult per night, with the potential to rent the youth hostel out for a week. The key must be picked up from YHA Kent St, Sydney, prior to arrival at the YHA. The key has a $50.00 deposit. To make a booking phone 9261 1111. More info. Veer right: Keeping the ocean to the right, this walk follows the beach to the northern end, to the base of a bush track which heads up the hill. Continue straight: From the end of Garie Beach, this walk heads up the short hill and through the grassy clearing to the base of the large hill. The walk continues up the steep bush track, winding up the steep rock and wooden steps as it climbs to the top of the hill. Continue straight: From the clearing at the top of the large hill, this walk follows the bush track heading away from Garie Beach and through the high scrub, continuing along for a while before coming to the signposted intersection of the ‘Curra Moors car park’ track. Continue straight: From the intersection, this walk heads along the narrow trail through the scrub, keeping the ocean on the right of the track. In various sections, metal walkways have been built to stabilise the environment in the area. 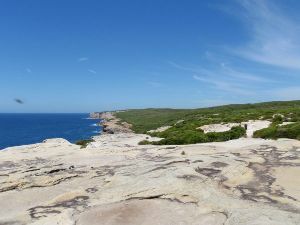 The walk continues like this, occasionally breaking out onto the rockshelf of the cliffs, until reaching a signposted intersection, marked ‘Wattamolla 2.9km’. Continue straight: Keeping the ocean to the right the track follows the bushtrack through the scrub and along the coast for a short while before coming to the information signpost with views of Eagle Rock. 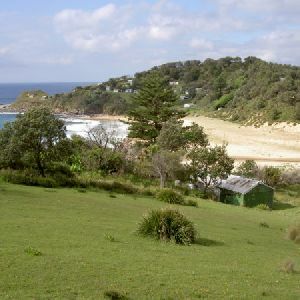 Eagle Rock lookout is an informal lookout marked by an information sign on the Coast track in the Royal National Park. The lookout is about halfway between Garie Beach and Wattamolla. Eagle rock is a piece of the cliff line that looks amazingly like the head of an eagle, with the eye and all. The lookout is about 150m west of the Eagle Rock on the other side of Carracurrong Creek. 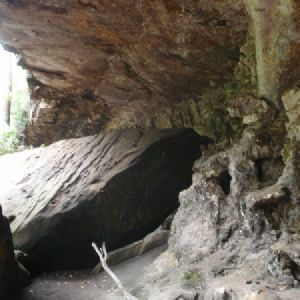 Eagle Rock is often used as an icon for the Royal National Park. 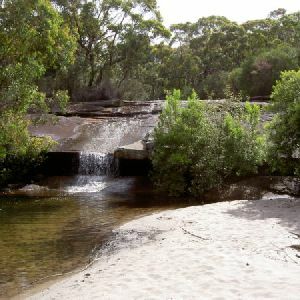 Carracurrong Creek also forms a waterfall into the ocean nearby. Continue straight: Keeping the ocean to the right the track follows the bushtrack winding through the scrub for a short while before it drops down a small hill to Curracurang Creek. From here the track crosses the creek and continues up through the heavy scrub, steadily climbing up a long hill until it reaches the top and continues down the other side following the small arrows and markers. The track continues to winds steadily down the long hill until it opens out at Curracurang Cove. Curracurrang Cove is a small cove about 1km SW of Wattamolla, on the coast of the Royal National Park. The cove faces east and is where Curracurrang Creek meets the ocean. The creek, the cove and the surrounding rocks provide great scenery, making this a relaxing place to stop and enjoy. 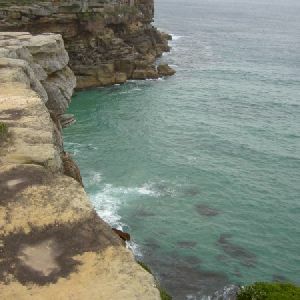 There is evidence that Aboriginal people lived in this cove. 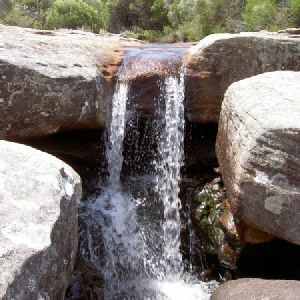 There are a few middens in the area, some rock shelters and Curracurrang creek provides a near-permanent water supply. 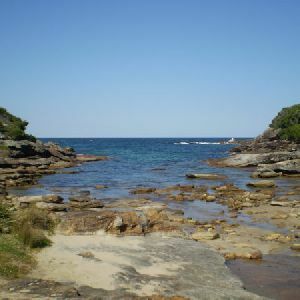 The cove was first occupied 7500 years ago and was used as a regular campsite by the Dharawal people. More info. Turn right: Keeping the ocean to the right, this walk heads up the hill along the bush track following the coastline, running close to the cliffs, until coming to a sign saying ‘Curracurrang’. At this point, the track widens to a management trail and heads away from the cliffs. Passing two large water towers, the trail heads down the long and gentle hill to an intersection at a large car park, marked by a signpost saying ‘Garrie 5.8km’. Turn right: From the intersection, this walk heads through the car park to the toilet block at the top of the pathway on the other side. 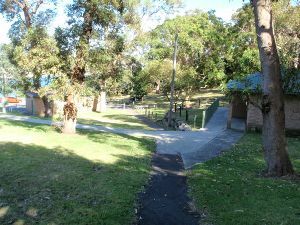 Turn left: From the toilet block, this walk follows the path down the hill and through the car park to the northern end of the picnic area, near the creek crossing. 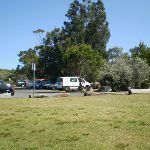 Wattamolla Picnic Area is found at the end of Wattamolla Road, about halfway along the coastline of Royal National Park. 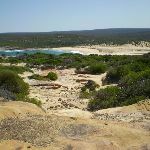 The area is blessed with a great beach, a lagoon and some wonderful creeks and rocks to explore. The small beach faces west and is tucked away in a deep bay. 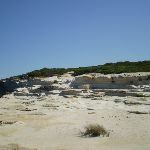 The lagoon sits behind the beach and is lined with sand on one side, and cliffs and rocks on the other shore. The picnic area has large open grassy areas, with some shade provided by trees and some picnic shelters. There is a small kiosk (often open weekends), toilets, electric BBQs and two car parks. There is water here, but needs to be treated before drinking. There is a gate on the road that is locked at night, the gate is open from 7am to 8:30pm. 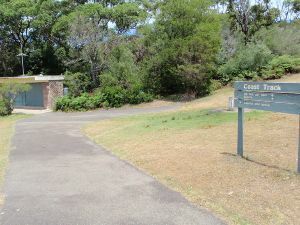 The Wattamolla Kiosk in the Wattamolla Picnic Area provides basic supplies for day visitors. The kiosk does not keep strict hours and opens depending on weather and demand. It usually opens on weekends at around 10:30am and closes between 4 and 6pm. You can buy ice-creams, drinks and some hot food. For more information, call Audley Kiosk on (02) 9521 2240. Continue straight: From the northern end of Wattamolla Picnic Ground, this track crosses the wide, shallow creek (keeping the ocean to the right). The walk then follows the track marker along the bush track, winding up the other and gradually climbing up a long hill through high scrub to Wattamolla Creek, where there is a small dam creating a swimming hole in the creek. This creek may become impassable after heavy or prolonged rain. 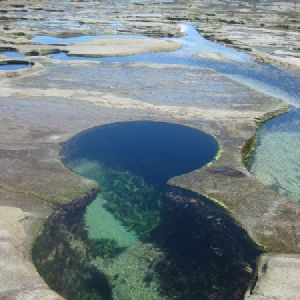 Wattamolla pool (or dam), Royal National Park, is a small water hole on Wattamolla Creek, above the lagoon. 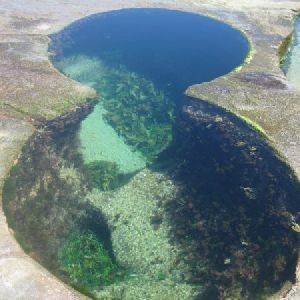 The pool is on the Coast Track near Wattamolla picnic area and offers a quiet spot for a dip and a rest. 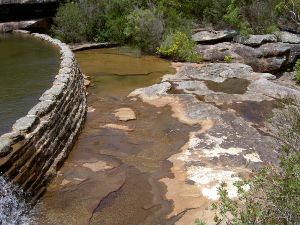 The pool is formed by a small, constructed sandstone dam and fed by a small waterfall above. Continue straight: From the swimming hole, this walk follows the bush track (with the swimming hole to the right) up the hill (east) and through the high scrub, as it winds up through some rocks, and up a long hill, to the intersection of the Marley service trail and the Coast Track. 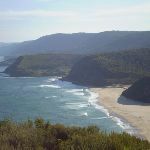 Veer right: From the intersection, this walk follows the ‘Coast Track’ arrow along the sandy bush track, which winds out to the coast, then turns left and follows the coast line. 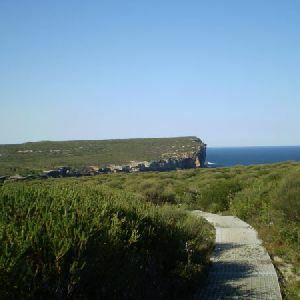 In large sections of this track, the trail goes along metal footbridges as it continues through the heavy scrub vegetation, until the track heads down off the clifftop along a well-signposted bush track to the end of Little Marley Beach. 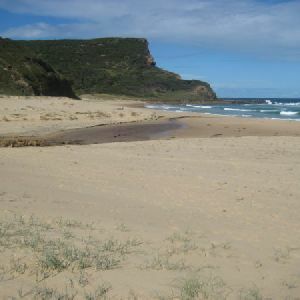 Little Marley Beach, Royal National Park, is a yellow sand beach, approximately 140m long. The narrow beach faces north-east and has a rock platform at either end. The beach is not patrolled and has no other services. For information on this beach’s pollution levels, follow the ‘more info’ link below. More info. Continue straight: From the end of Little Marley Beach, the walk heads north across the beach, keeping the ocean to your right until coming to the start of a bush track. 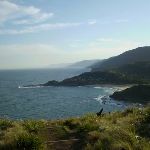 This walk continues along the bush track as it heads up and onto the ridgeline, where there is a fantastic view of the ocean. 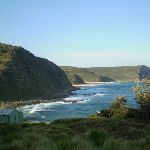 From here, this walk continues along the flat bush track and the cliff’s edge until coming to an intersection with a bush track on the left. Veer right: From the intersection, this walk follows the bush track along the coast, keeping the ocean to the right for a short while before the track descends steeply off the rock-shelf and down a rough bush track to the end of Marley Beach. 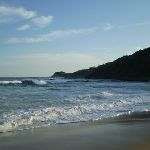 Veer right: From the end of Marley Beach, this walk follows the coast across the beach until coming to a large green information sign on Aboriginal culture in the area. This is the start of a bush track that heads up the hill to continue along the coast. Continue straight: From the end of Marley Beach, the walk passes the large green information sign and climbs up to the top of the long hill. Here the walk continues along the bush track for a short while before coming to an intersection with a management trail heading away from the coast. This intersection is marked with a small sign saying ‘Coast Track’. 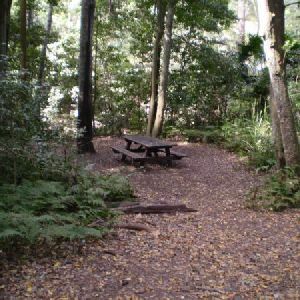 Veer right: From the intersection, this walk follows the bush track heading north-east along the coast, winding through the high heath for about 1.5km until the track descends into a large gully along hardened path. 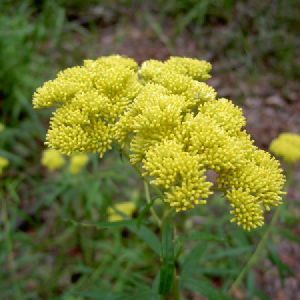 At the bottom, it crosses a small bridged stream. From here, the track continues up the other side of the gully, using the rock steps to the top. From here, the track follows the post markers along the track to the clifftop coastline, however on a few occasions the track will split into two and meet up again a short while later – just stick to the track closest to the coast. 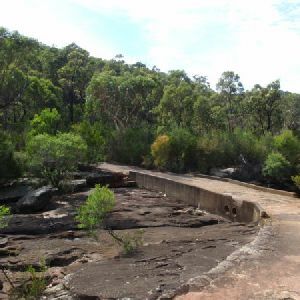 After several hundred metres, the track comes to an unsignposted vantage point at the end of the rock platform, where the bush track turns inland. This unfenced, informal lookout is perched high on the cliffs, looking east over the South Pacific Ocean. The lookout is not signposted nor officially named, but provides great view south along the escarpment. 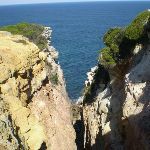 Cliff edge may be unstable and fragile – keep a safe distance. Turn left: From the edge of the cliffs, the walk heads north-west up and away from the ocean, following the main bush track for a while before coming to an intersection with an asphalt management trail at the ‘Coast Track’ signpost. Turn right: From the intersection, this walk follows the asphalt management trail north past the ‘no bicycles’ sign to the nearby intersection with the sandy management trail. Continue straight: From the intersection, this walk heads north around a sweeping left-hand bend along the sealed management trail. Soon, the trail leads past a track (on the right) then passes around a locked gate at the end of of Beachcomber Ave and a ‘Coast Walk’ information sign. Continue straight: From the end of Beachcomber Ave, this walk heads along Beachcomber Ave north-west and gradually around to the north, until turning left into Scarbourough St. The first right is taken into Bournemouth St, then left into Loftus St. The walk continues along this road until turning right into Brighton Rd. Bundeena Ferry is located at the end of Brighton St.
Bundeena is a small township at the northern end of Royal National Park and the southern side of the entrance to Port Hacking. The town can be accessed by car or ferry. There are a few B&B’s and other accommodation options and a number of cafes to choose from. 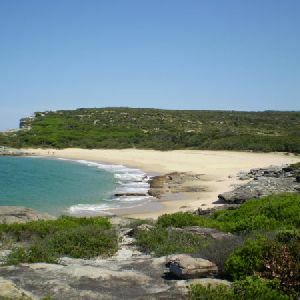 Bundeena has a mixed atmosphere, partly a beach holiday community but also home to some permanent residents. There are two main beaches – Hordens Beach to the west and Jibbon Beach to the east. Both are nice beaches inside Port Hacking. More info. 19km of this walk has short steep hills and another 3.5km is very steep. Whilst another 3.5km has gentle hills with occasional steps and the remaining 1.5km is flat with no steps. 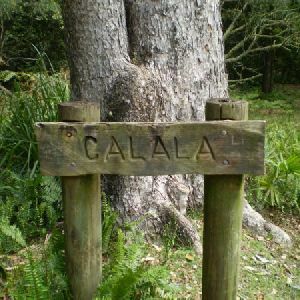 16km of this walk follows a formed track, with some branches and other obstacles and another 9km follows a clear and well formed track or trail. The remaining (2km) follows a smooth and hardened path. Around 15km of this walk is clearly signposted, whilst the remaining 12km has directional signs at most intersection. 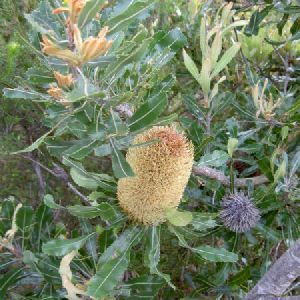 Around 17km of this walk requires no previous bushwalking experience, whilst the remaining 10km requires some bushwalking experience. This whole walk, 27km is not usually affected by severe weather events (that would unexpectedly impact safety and navigation). 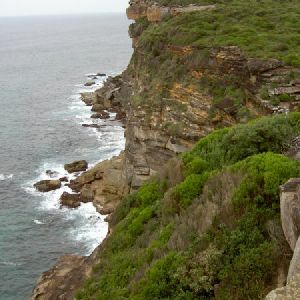 Around 17km of this walk has limited facilities (such as not all cliffs fenced), whilst the remaining 10km is close to useful facilities (such as fenced cliffs and seats). 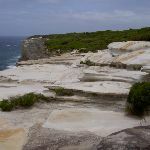 A list of walks that share part of the track with the The Coast Track (Otford to Bundeena) walk. Providential Point is a quick and easy walk to see some beautiful coastline. The walk passes through the Providential Point campsite and continues out to the fenced cliff edge. 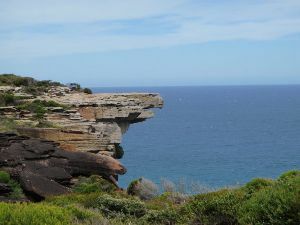 These views are complemented by the large cliffs on either side of the lookout on this great short walk. 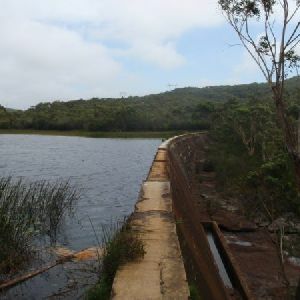 This short return walk starts from the Wattamolla picnic area car park, and winds north along the Coast Track to the Wattamolla Dam. The small dam is nestled below a waterfall on Wattamolla creek and is a great spot for a quiet dip before lunch. 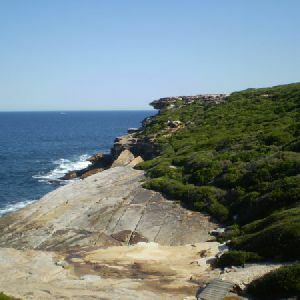 This return walk starts from the southern car park at the Wattamolla picnic area and winds south, further into the Royal National Park. 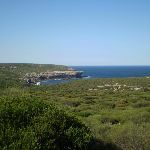 The walk follows the service trail that provides views across the coast and then follows a bush track down into Curracurrang Cove. The cove is a nice narrow nook in the coast line where a number of archaeological findings have been made in the past. 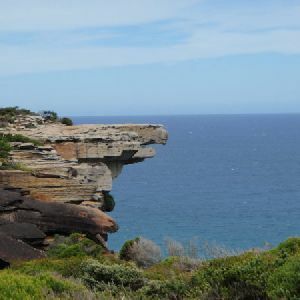 On this loop walk you will enjoy some grand ocean views, a few secluded beaches, rock shelves and some Aboriginal engravings. 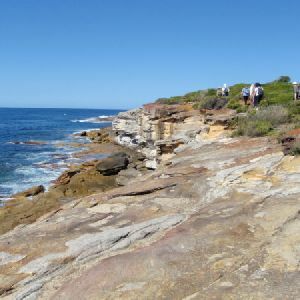 The walk starts in the community of Bundeena and follows the roads to Jibbon Beach then along the track to Jibbon Head and Shelley beach, then a long stretch of sandy management trail through the heath. 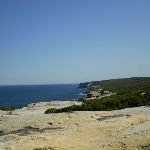 The walk also describes a side trip to Bundeena Lookout. 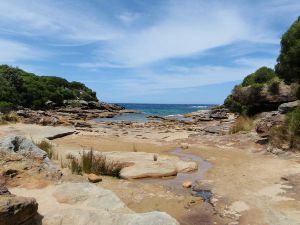 The walk from Wattamolla picnic area to Eagle Rock is an excellent way to see the the Royal coastline and the Eagle Rock formation. 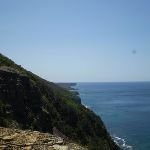 This walk heads south from Wattamolla, following the Coast Track, leaving the sea cliffs for a while to pass through some beautiful heath, then back to the coast, to the Eagle Rock Lookout. The walk returns to Wattamolla the same way, for a bite to eat and a swim. 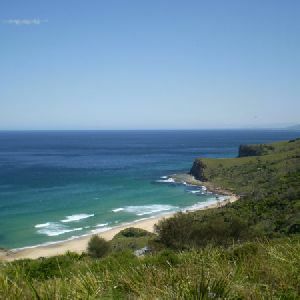 The Wattamolla to Garie Beach walk is a scenic coastal stroll which takes you along the top of the coastal cliffs, before dropping down to the fantastic Garie Beach. 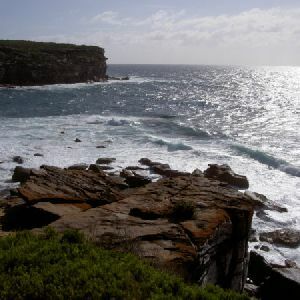 The coastal cliffs give views out to sea, with many ledges also giving views down onto the waves crashing into the rock. 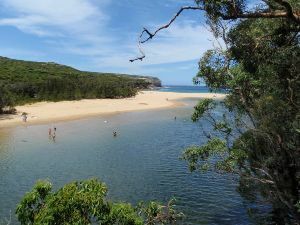 The descent onto Garie Beach has some of the best views of coastline in the Royal National Park. This walk is the most direct route down to Big and Little Marley. The beaches are fantastic, secluded areas with Big Marley hosting a large sand dune and lagoon. The beaches are not patrolled and can have dangerous surf conditions, so take care. Deer Pool, and it’s waterfall, is also a highlight on the walk in. 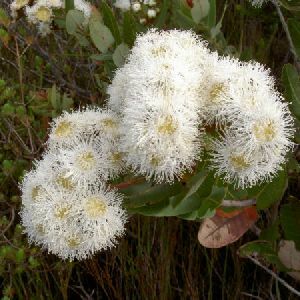 This walk is an excellent loop which takes in both the coast and the heathy inland of Royal National Park. Nearly the whole walk has views of the sea. Big Marley and Little Marley are great places to wet the feet. The dunes behind Big Marley are also worth exploring, as is Deer Pools if time allows. 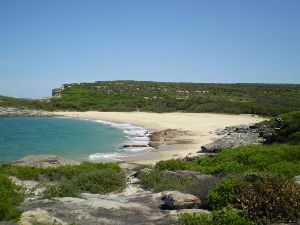 From Bundeena, this walk heads south to the coast and then loops around Marley Head. The environment changes from heath to open, rocky platforms along the cliffs. 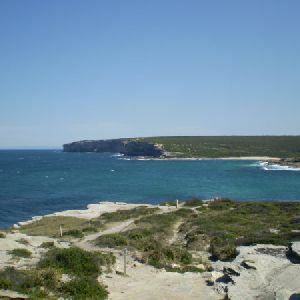 There are great views from Marley Head, and the section between Marley and Bundeena Lookout is just astounding. 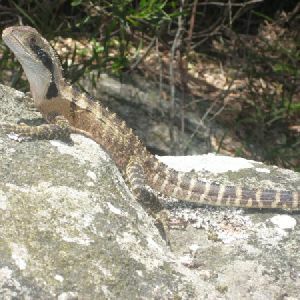 Look out for lizards in the heath sections, as it abounds with wildlife. 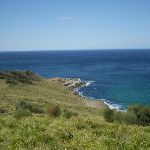 A list of walks that start near the The Coast Track (Otford to Bundeena) walk. This circuit around Lake Toolooma makes a lovely walk through Heathcote National Park. This walk mainly follows management trails and provides a few views of the lake. Although most of the walk is not in view of the lake, there are great views from the top of the western ridge. http://new.wildwalks.com/wildwalks_custom/includes/walk_fire_danger.php?walkid=nsw-royalnp-tcttb Each park may have its own fire ban, this rating is only valid for today and is based on information from the RFS Please check the RFS Website for more information.